Bring your business to life with Smart IT Solutions; creating fresh, sleek, innovative web designs to pixel perfection. Following the global commercial market trend, the importance of a strong online presence is proven by the growing number of SME’s..
Smart IT Solutions’ marketing team will effectively pinpoint the right channels to get your message out to the right markets;..
Is a leading market in uae and middle east in all aspects of digital, print, sms, email and social media marketing since 2006, partnering with major regional and multinational companies to design w3c standard creative websites, and innovative solutions for marketing. We specialize in helping our clients to connect with their customers, promote their ideas, products and services worldwide. Our exceptional mixture of innovation, creativity and professionalism converge through our high-class services. We provide our clients with various IT and marketing solutions that are wrapped up with neat designs and illustrations. ; leading them to the successful path of their brand and image establishment. Smart IT Solutions is the place where creativity takes shape and is realized with the aim of achieving the objectives set by the marketing plan in full compliance with budget and timing, optimizing resources and assets, and achieving results that are characterized by freshness, innovation, and when necessary, irony. 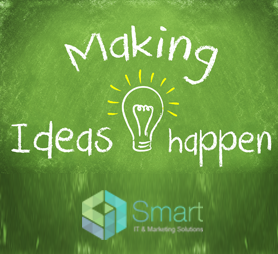 The creative team at Smart IT Solutions got their own original approach, we focus on what we want to create, and allow ourselves to navigate into uncommon concepts, we build connection between our ideas to create new opportunities and possibilities. We use a unique system that leads us recognizing the real needs of a client. At the agency, we study the consumer behaviors in the market and understand the features of the brand, our tactic allow us to extensively engage with the product or service that our client is offering.